Fort Wayne, IN - The Komets gained four points in week 22 of 2017-18 and improved to 41-16-3 and 85 points and continue to trail first-place Toledo in the Central division by four points with two games in hand. Four weeks and a dozen games remain in the regular season slate. As the Komets head into week 23, one point is needed to clinch a 2018 ECHL playoff berth. 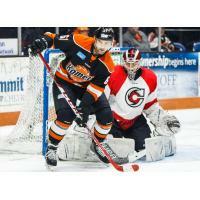 The week started with the Komets logging their 40th win of the season at Kalamazoo on Friday 6-2. It's the fastest the Komets have reached 40 wins in an ECHL season needing only 58 games. The Komets mounted a three-game win streak after turning back the Cyclones Saturday in Fort Wayne 4-1. The brief win string was snapped Sunday in Fort Wayne with a 6-3 setback to Kalamazoo. Fort Wayne's home point streak also ended at 11 games (10-0-1). For the week-- Gabriel Desjardins scored three goals and an assist for a four-point week and Justin Hodgman dished three assists and added a goal for four points. Zac Larraza bagged a pair of goals in Fort Wayne's 4-1 win over Cincinnati. Dennis Kravchenko collected two goals and added an assist while Artur Tyanulin scored a goal and two assists. Marco Roy added three points to his totals with a goal and two assists. Anthony Cortese made himself at home with a goal and two assists. Louick Marcotte and Garrett Thompson each had a marker for the week. Garrett Bartus started all three games in the Fort Wayne net going 2-1-0 with a 2.69 goals-against average and stopped 100 of 108 shots for a .926 save percentage. Streaking Komets-- Artur Tyanulin has a team season-high nine-game point-scoring streak (3g, 8a), a nine-game road point streak (3g, 9a), a five-game road assist streak (6a) and a four-game home point-streak (3g, 2a)....Gabriel Desjardins has points in four straight games (4g, 2a), a three-game goal-scoring streak (4g) and a three-game road point streak (3g, 2a)....Garrett Thompson has a three-game home point streak (1g, 3a). Milestone-- Curtis Leonard, the Komets iron man at 60 games, eclipsed his old career season high of 13 assists with his 14th and 15th assists Sunday and matched his career season high of 17 points. Komet leaders-- Shawn Szydlowski leads with 41 assists, 68 points, +38 and 194 shots.....Gabriel Desjarding leads with 28 goals....Cody Sol leads with 105 penalty minutes.....Ryan Culkin continues to lead Fort Wayne defensemen with 11 goals, 27 assists and 38 points. The week ahead--- The Komets head east with a match at Reading Wednesday at 7pm. Friday the Komets face the Thunder at Adirondack at 7pm. It will be the only trips to Reading and Adirondack of the season. The Komets cap the week with a 7:05pm faceoff at Worcester Saturday. The next Komet home game is Wednesday, March 21 when Kalamazoo returns for the final meeting of the season at 7:30pm. Get your tickets early-- Tickets are on sale at the Coliseum Ticket Office. Save on Group tickets and Flex tickets on sale at the Komet office at 1010 Memorial Way in Fort Wayne. For more information visit the Komet office, Komets.com or call 260-483-0011. Komet Hockey on WOWO-- Komet games are scheduled to air on WOWO AM 1190 and FM 107.5. All radio broadcasts also stream live at Komets.com presented by OmniSource Radio Recycle. Fans are invited to follow the action as Shane Albahrani handles the play-by-play.